Some good friends of mine asked for my help in getting rid of their old Plymouth Voyager that had been sitting at the bottom of their driveway for long enough that I had been suggesting cutting a hole in the roof and planting a yucca inside of it. It was purchased new in 97 (or 98, I don’t remember), and he drove it until it suffered a not minor engine fire about a year and a half ago. The odometer shows well over 200k, but the speedometer and odometer had only been working intermittently for the last five or six years. It was survivor from the Midwest before they moved to Southern New Mexico. After the fire it was a done for. Conveniently, it caught fire in their driveway, but took long enough to extinguish with a hose that under hood temps got hot enough to burn or melt every under hood component not made of metal. There had been talk of donating to NPR, or even calling the Cash for Cars salvage folks that advertise that they’ll take junk cars away. 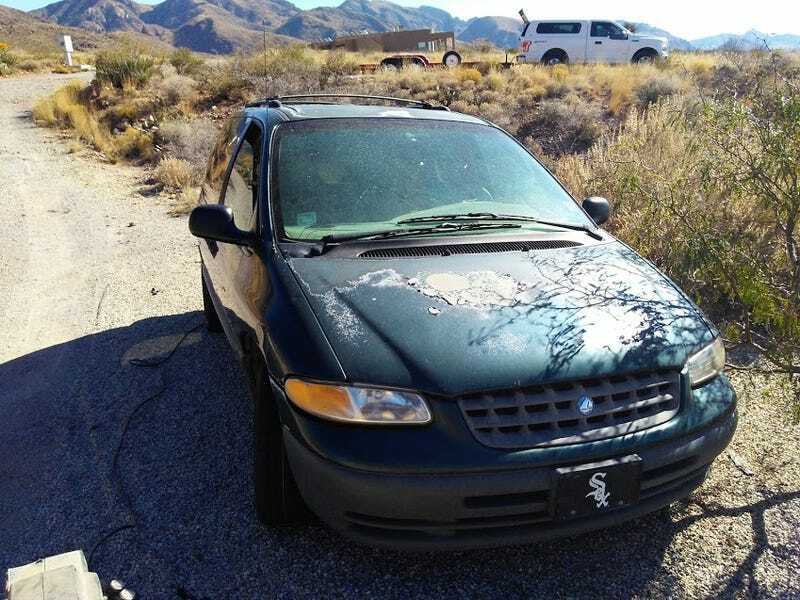 It turns out there are some limitations on that, and mentioning the vehicle is a non-running 90's Caravan that suffered an engine fire and is located in a rural area twenty minutes out of town means that no one will ever show up to haul it away. After a few months of it being in the way, they put in neutral and let it roll down to the ditch at the bottom of their driveway where it sat for the last year or so. On Saturday I went over and worked on getting it out of the hole it was in. The picture at the top of the post doesn’t really show well the hole it was in and how steep their driveway is up to the road. There is actually a long list of vehicles that have gotten stuck in their driveway over the years (including a garbage truck, UPS trucks on a regular basis and a propane truck more than once). Getting up to level ground turned out the be harder than I anticipated. Even with the rear diff locked, it still took a few tries via tow strap to the back of my F-150 to get the minivan up the hill. Copious amounts of wheel spin were involved that shot more rock and gravel into the back of the van than I realized. It ended up breaking the back window on the final, and successful, attempt to get it up the hill. He’ll have to do a bit of driveway maintenance to fill in the ruts left... A 4WD truck would’ve been handy for this job, as I could’ve crawled up the hill in 4Lo. This morning I started calling around to the various salvage yards in he borderland. It turns out there isn’t much demand for 90's Chrysler minivans that have suffered engine fires. Most of the salvage yards said they wouldn’t take it, as stripping it for crushing would cost them more than the scrap value. I ended up finding a salvage yard North of Las Cruces that offered 50 dollars for it. An hour later we pushed it off the trailer and gave them the title and key. We even finished up in time to make our standing Monday afternoon golf game.